How long are you willing to wait for a Eiramor puppy? Do you already have a dog at home at this present stage? Have you owned a LARGE or 'Shepherd' breed before ? What type of puppy registration are you looking for? If you have chosen "Main Register" above please tell us your experience of showing /breeding. If you have chosen "Limited Register" above are you happy to desex your puppy at an appropriate and agreed to age? Do you have a dog proof fenced yard? For your puppy to go outside and play? Where will your puppy spend 90% of its time? While puppy is outside will puppy be tethered or able to roam free in a backyard? If answered "Yes" to above question what ages and will they be involved with the puppy? All of our puppies will be sold with a legal and binding contract, are you prepared to sign one? In your opinion is there a difference between the White Swiss Shepherd and a White German Shepherd ? If you want to breed from your Eiramor White Swiss Shepherd puppy in the future , are you prepared to listen to our advice? 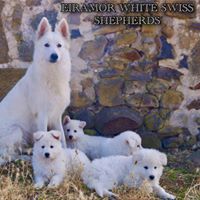 How did you learn about Eiramor White Swiss Shepherds? If there is any other information you feel is relevant please include your comments below. Thank you for your time we will be in contact soon.Please fill in our ANTI SPAM and click SUBMIT.